From Pistoia we got on the train toward Florence but stopped at another walled medieval town, Prato. It was a long walk to the walls of the city and we reached the cathedral shortly before it closed. 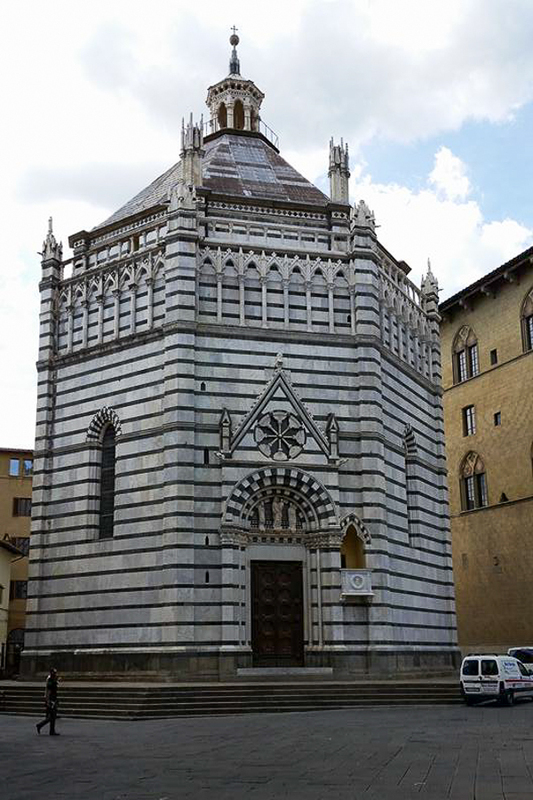 The cathedral is dedicated Saint Steven Martyr (Stefano). 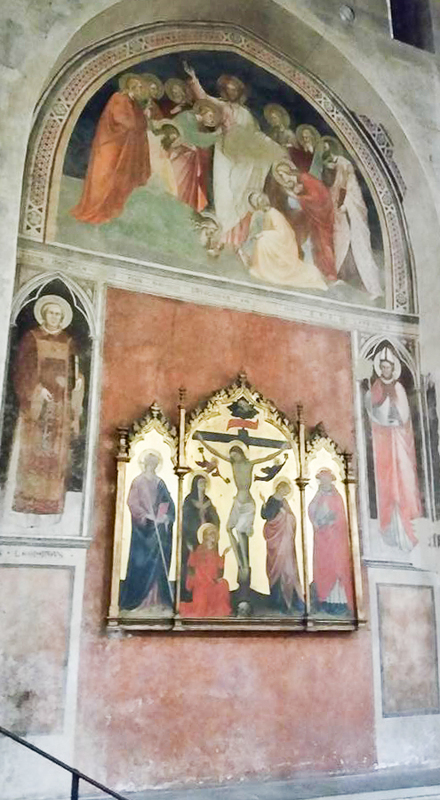 The draws were the 15th century Filippo Lippi frescoes behind the main altar. One side showed scenes of Saint Steven’s life and martyrdom, and the other side reflected the same scenes in the life of Saint John the Baptist. 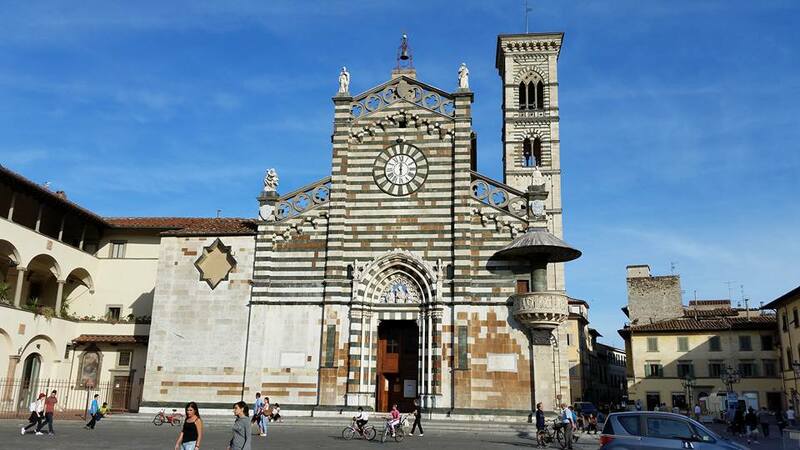 Prato is the place where Lippi met the nun, Lucretia Buti who became his wife. The famous relic is Mary’s Belt. The legend relates the belt (or girdle) was dropped to Saint Thomas the apostle as she was assumed into heaven. As Thomas had doubted the resurrection until he had proof, the belt served as proof of Mary’s Assumption. 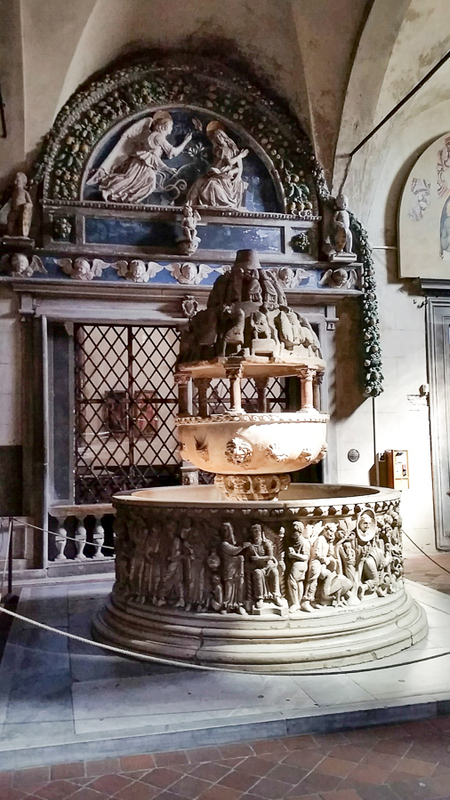 The relic came to Prato as a dowry of a young noblewoman to a local nobleman. The belt is housed in a special chapel in the cathedral. 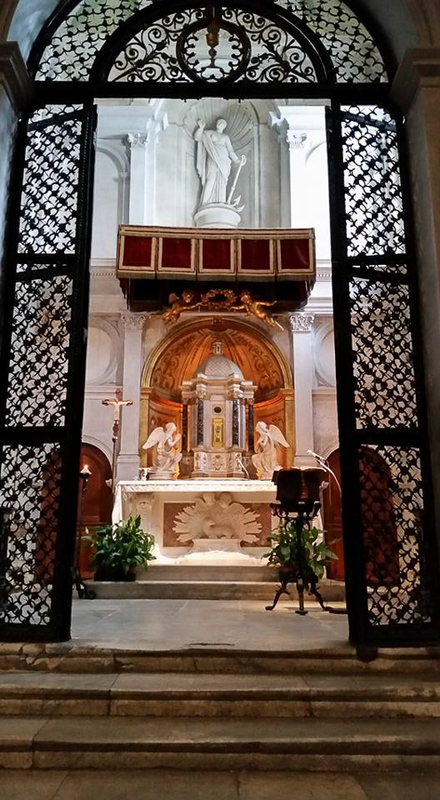 The cathedral also has an exterior pulpit designed by Donatello. Nearby was a castle started but not finished by Frederick II. This became part of the city fortifications. Now it provides views of the city. Interior of cathedral. Prato, Italy. Altar with Mary’s belt. Cathdral. Prato, Italy. Entrance to castle. Prato, Italy. 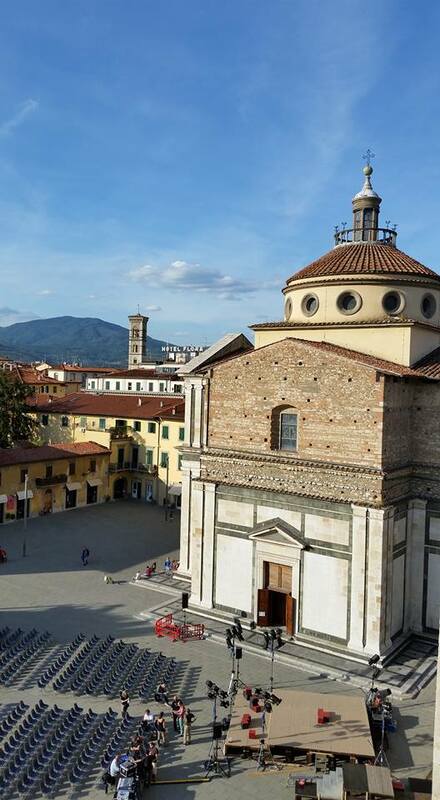 View from Castle (Church of Maria della Carceri). Prato, Italy. View from Castle. Prato, Italy. It was a busy day. The pedometer on our phones registered 15 miles walked. 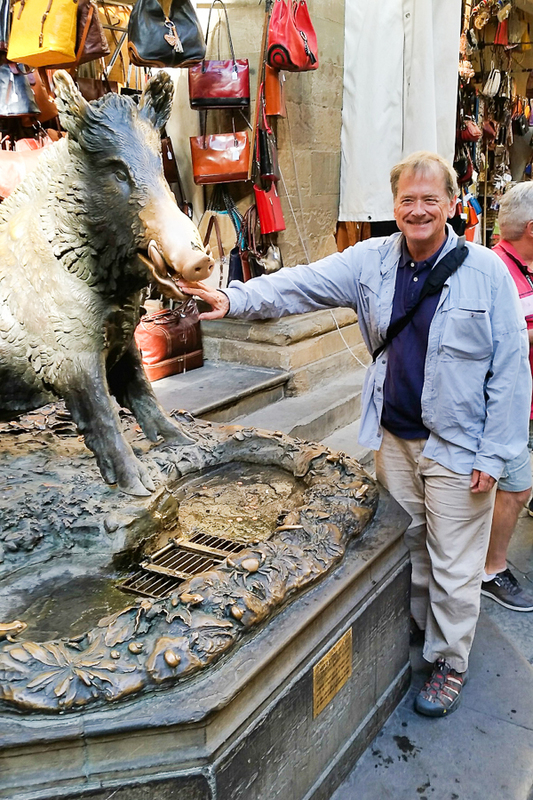 We returned to Florence for a dinner that included cinghiale (wild boar). This entry was posted in Travel and tagged Fra Filippo Lippi, Italy, Pistoia, Prato, wild boar on September 10, 2015 by frjfkauffmann. Wednesday, Sept. 9. Today we decided to roll three day trips into one. 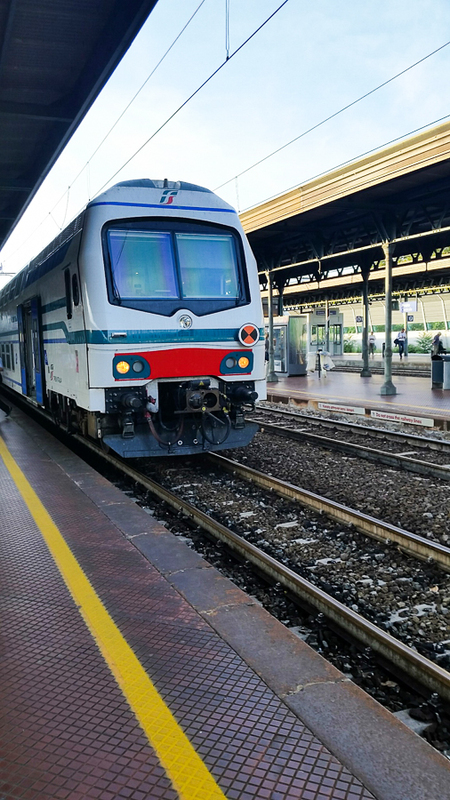 We left early to take the regional train to Lucca. 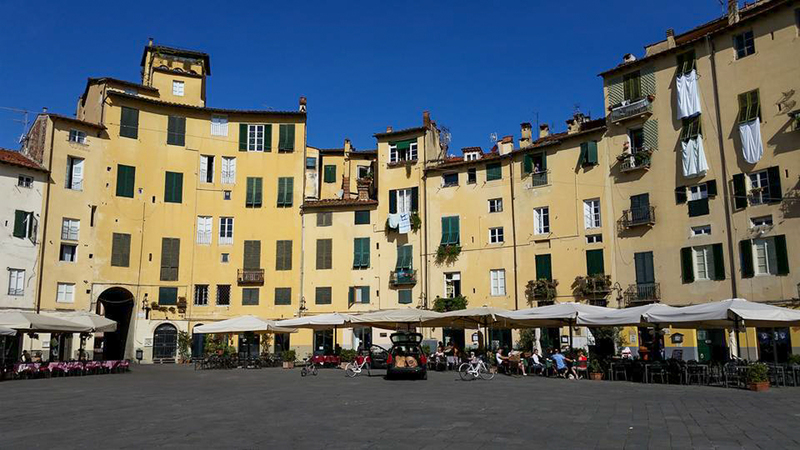 Lucca is a beautiful medieval city enclosed by a Renaissance wall. 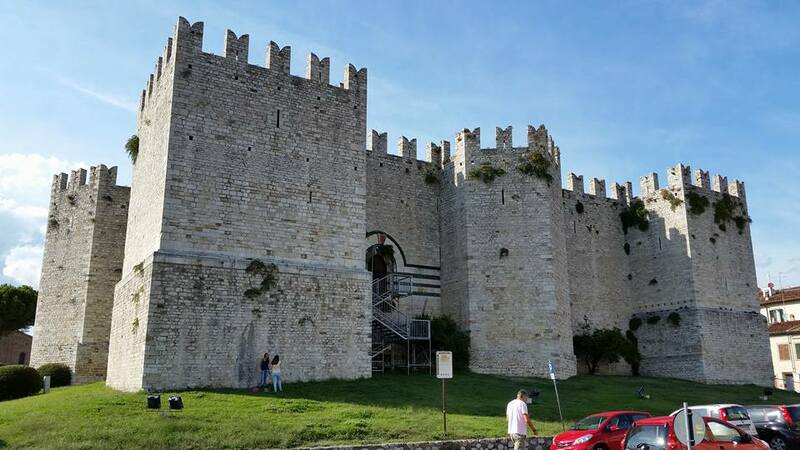 A Renaissance wall had to take the impact of more powerful weapons, so the stone is backed by earthen walls. 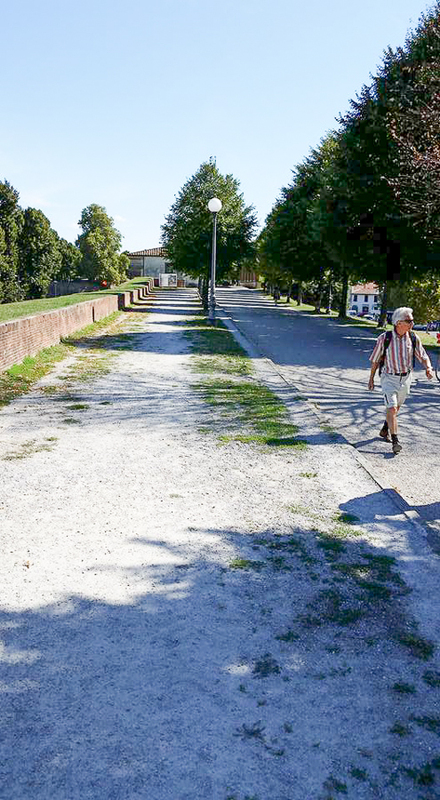 The benefit for Lucca is that the wall has become a walking / running / biking trail that encircles the center of Lucca. 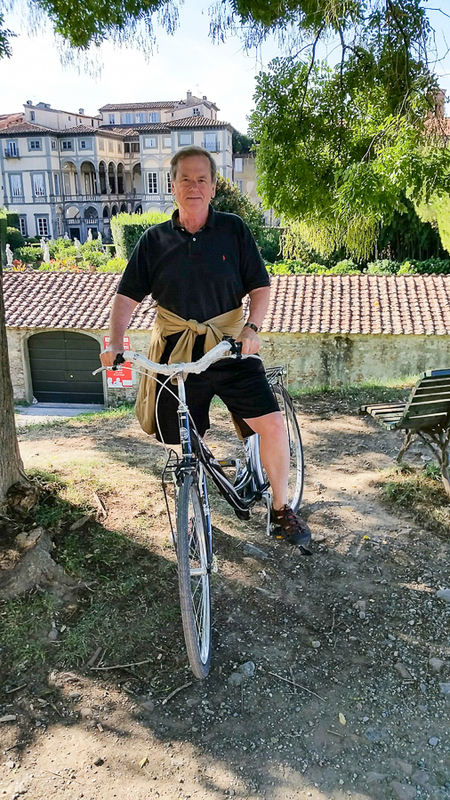 We rented bikes and enjoyed circling the wall twice, and the traffic – foot and wheel – was brisk. 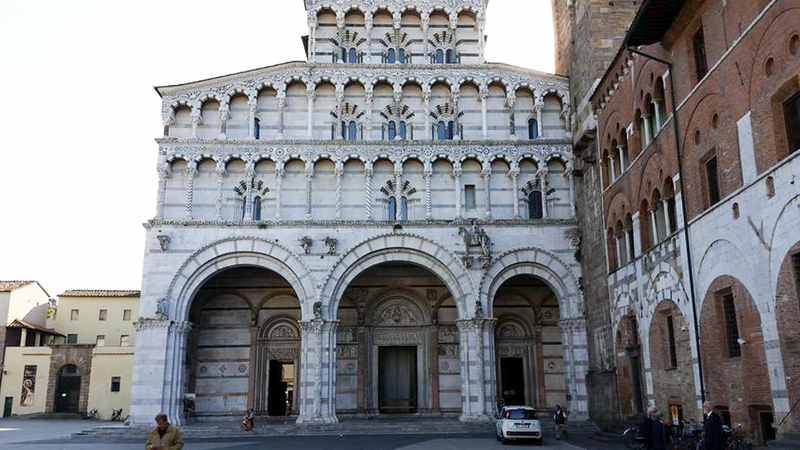 When we entered Lucca we came to its cathedral dedicated to Saint Martin of Tours. The cathedral was closed for visitors but was open for Mass, which we attended. From the outside it is impressive, with alternating dark and light horizontal stripes and series of blind arches supported by decorative columns. The story is that the architect had a contest for masons to each carve a column with the winner getting the commission for the whole church. The architect kept the columns and awarded no commission. True or not, each column is different. 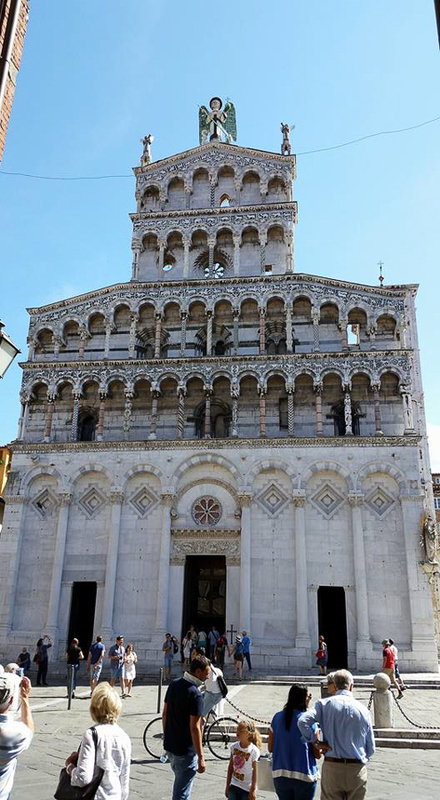 Duomo (Cathedral) of Saint Martin of Tours. Lucca, Italy. Detail of doorway. Cathedral of Saint Martin of Tours. 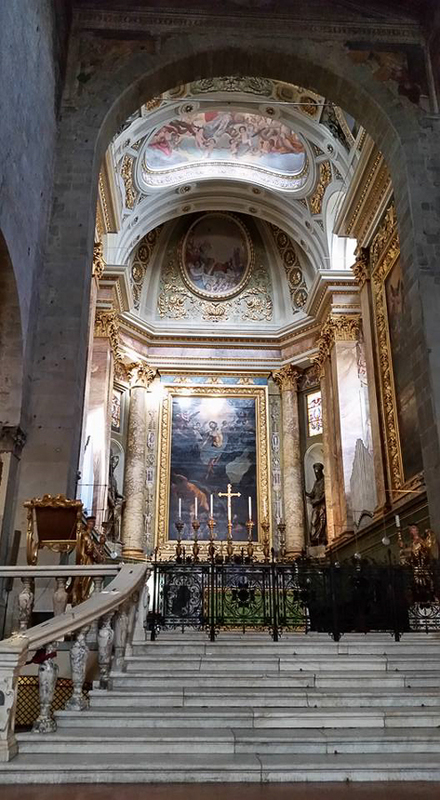 and after Mass we explored the main altar, the side altars and a free-standing marble shrine to the Sacro Volto (or Holy Face). 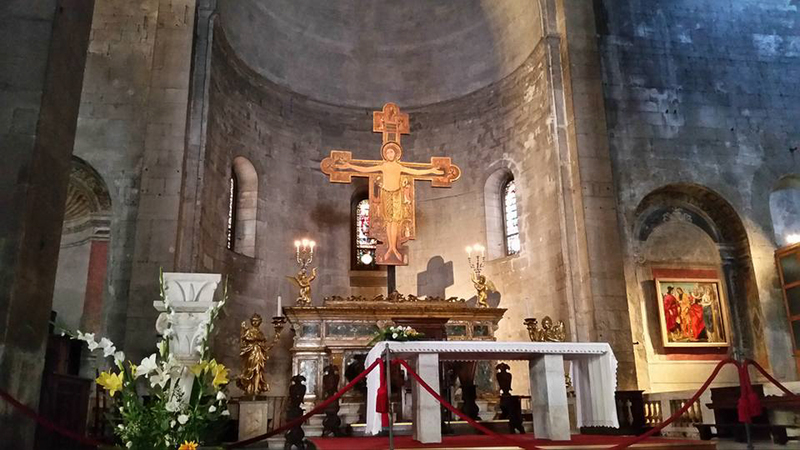 The legend is that Joseph of Arimathea carved a crucifix but felt incapable of accurately carving the face of Jesus. He prayed for help, went to sleep, and in the morning the face had been miraculously completed. 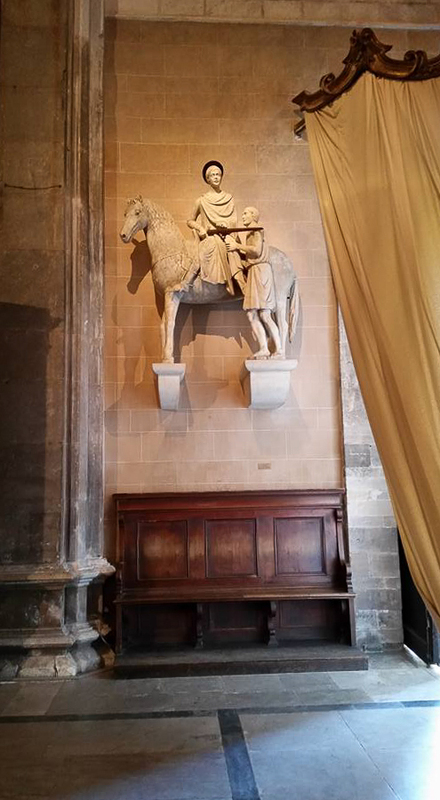 Statue of Saint Martin of Tours. Cathedral. Lucca, Italy. 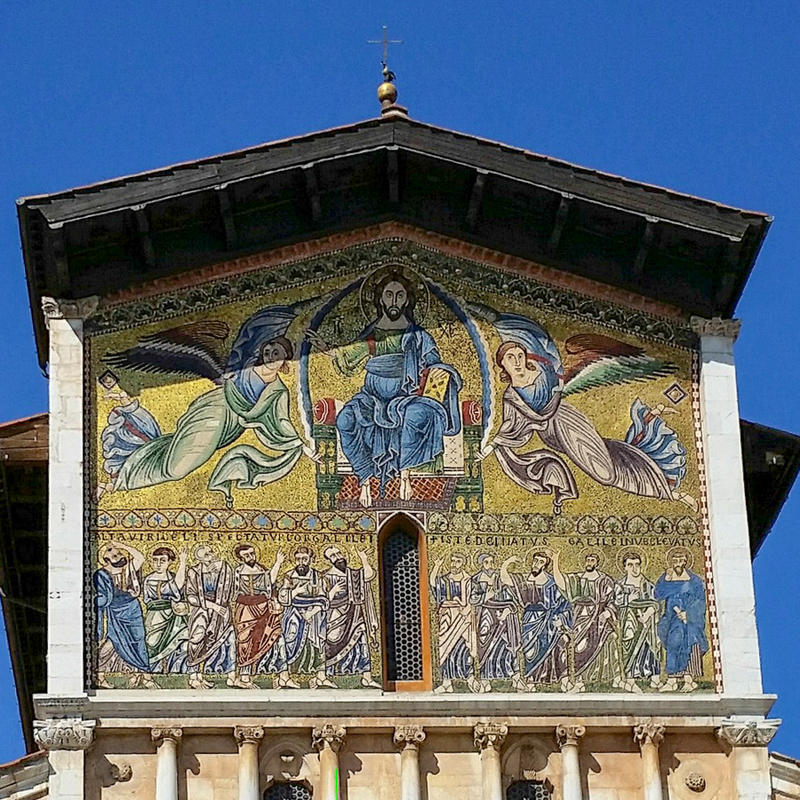 We saw the church of Saint Ferdinand which had a spectacular mural in the front. This also had an impressive della Robbia image over the font. Saint Ferdinand Church. Lucca, Italy. Baptistery at St Ferdinand. Lucca, Italy. 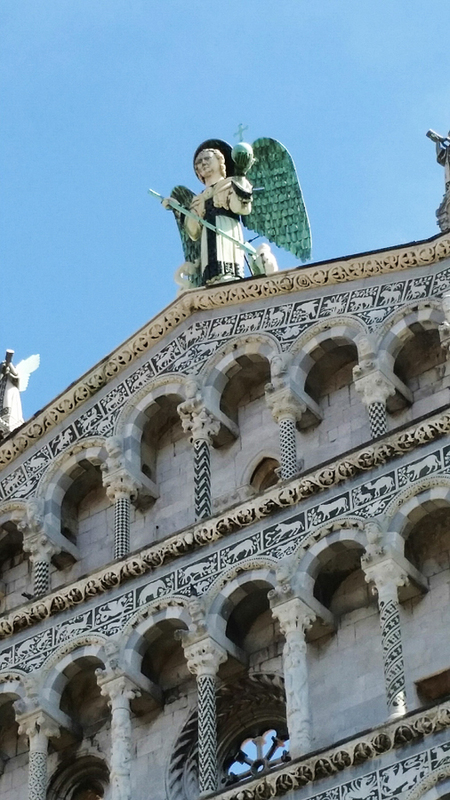 Saint Michael is another impressive structure. 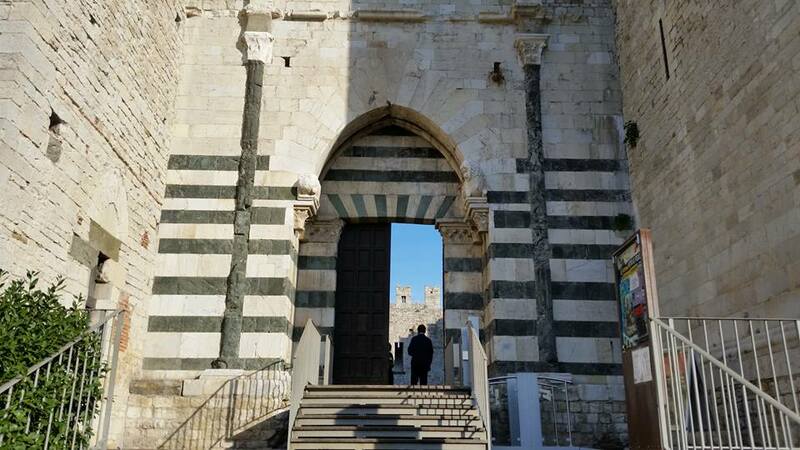 It reflects the same striped exterior, blind arches and columns of the cathedral, even exceeding it, and has a wonderful altar and crucifix. Saint Michael Church. Lucca, Italy. Commercial area built ibto a Roman Amphitheater. Lucca, Italy. 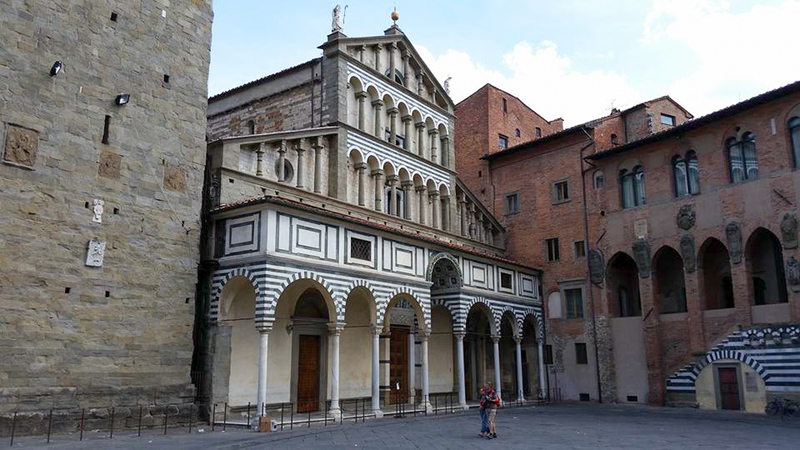 We took the train, retracing our steps toward Florence but stopping in Pistoia. If the name reminds you of a small handgun it is with reason. The inhabitants had a reputation for violence, against one another and outsiders. They were innovative in all sorts of weapons, and invented the pistol. Luckily we did not have this experience. Although a walled city the walls are over so much area that you do not get the feeling of being in a walled city. Our goal was two of the many churches there. We arrived in the afternoon to find the cathedral closed for siesta. 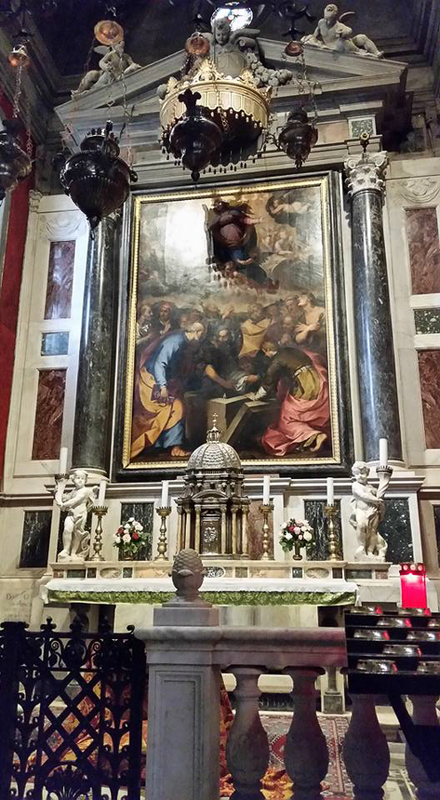 We did find Saint Andrea church known for the carved pulpit portraying rather realistically the murder of the Holy Innocents. The outside was a simplified version of the striped churches we’d already seen today, but still beautiful. We doubled back and saw the cathedral dedicated to Saints Zenon and James (as in Santiago). It was open by then. 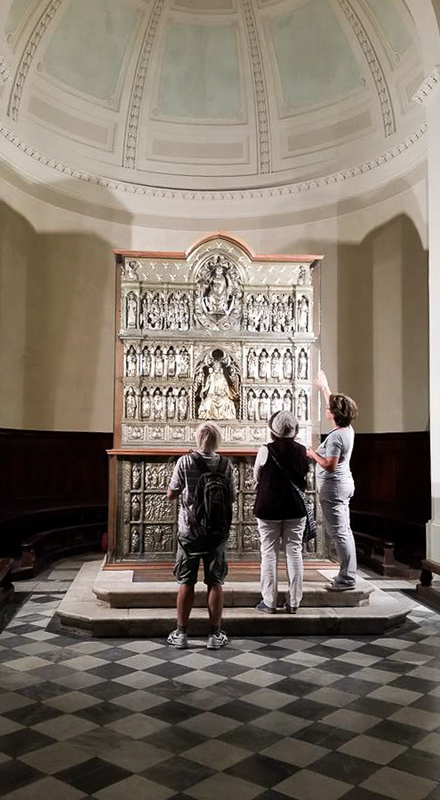 The prize possession is an altar piece rendered in silver (literally a ton of silver) portraying scenes from the life of Saint James. 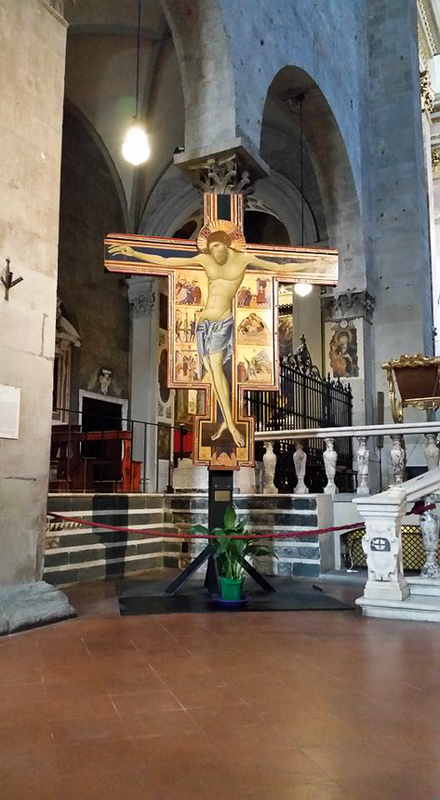 Also a gorgeous crucifix. 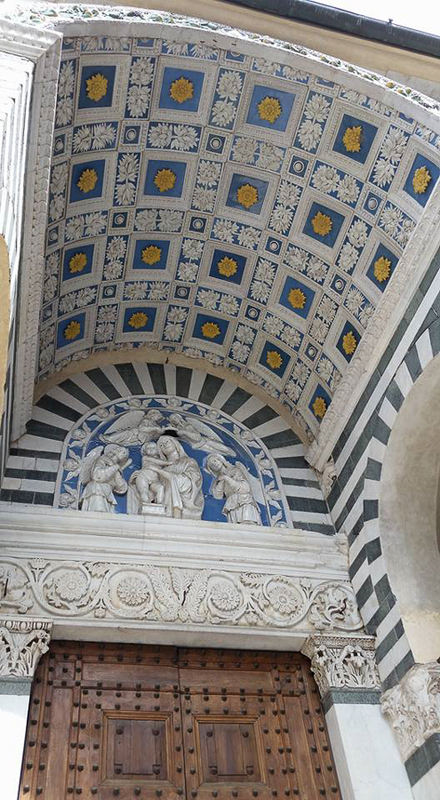 The doorway was decorated in della Robbia sculptures, common for this area. 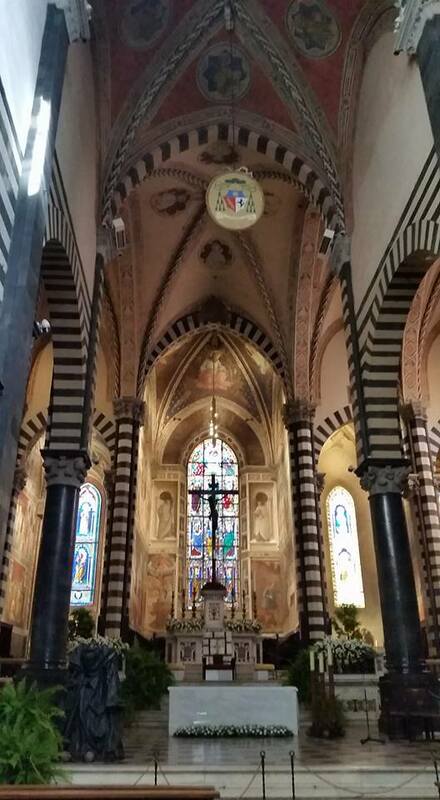 Duomo (cathedral) dedicated to Saints Zenon and James. Pistoia, Italy. 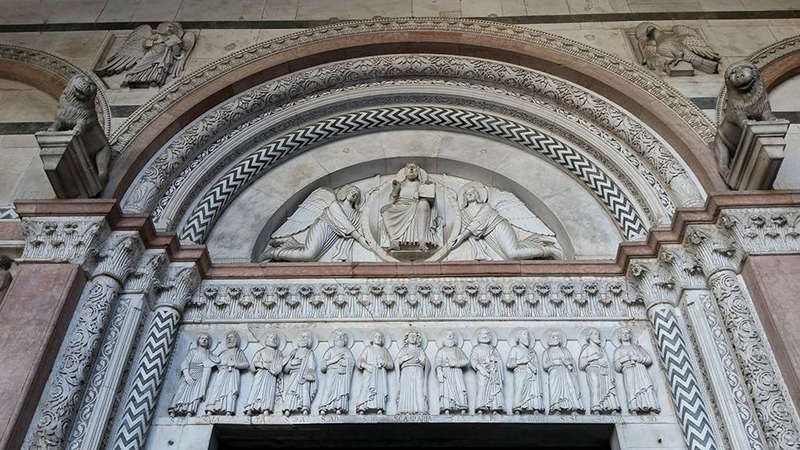 Doorway detail of cathedral. Pistoia, Italy. Sanctuary of cathedral. Pistoia, Italy. 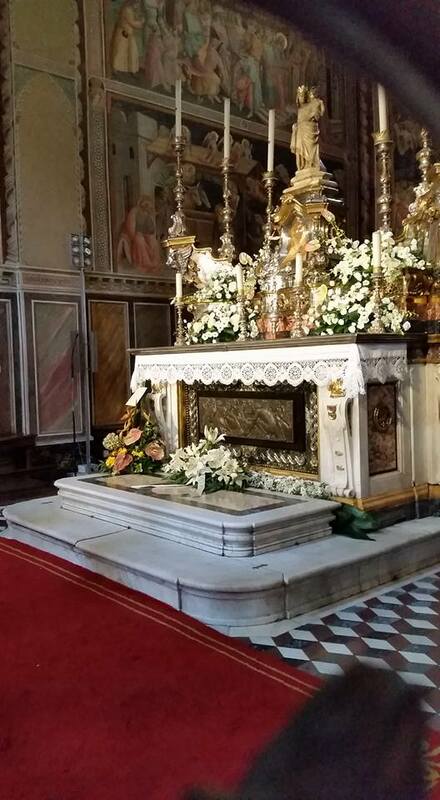 Silver altar of Saint James. Cathedral. 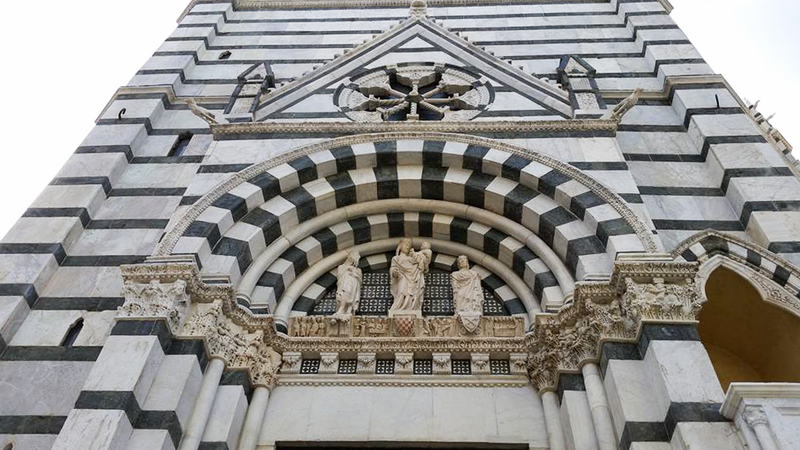 Pistoia, Italy. 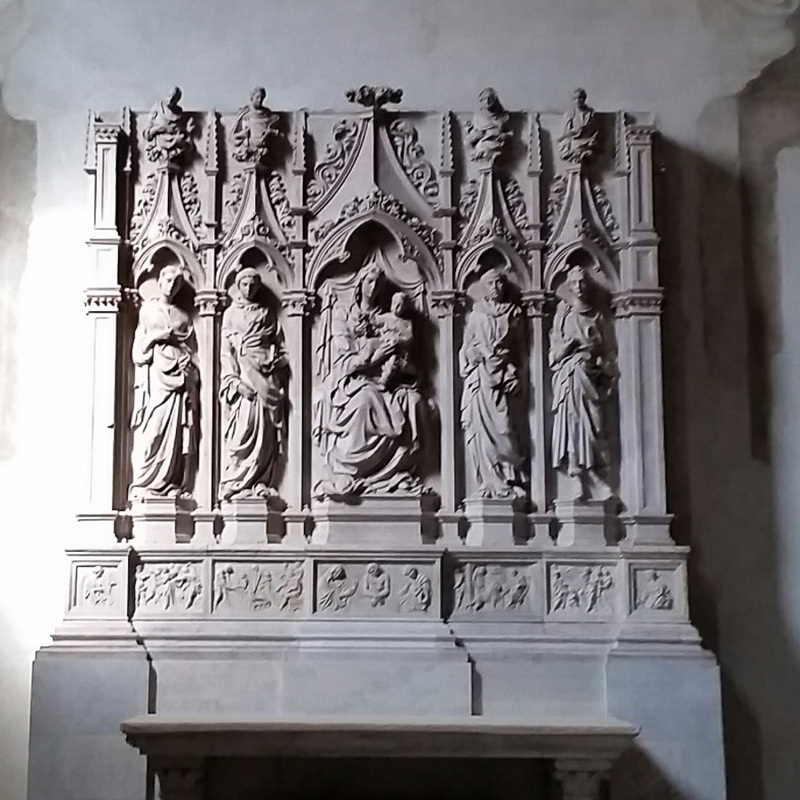 Side Altar. Cathedral. Pistoia, Italy. Devotional image. Cathedral. Pistoia, Italy. Saint Andrea Church. Pistoia, Italy. 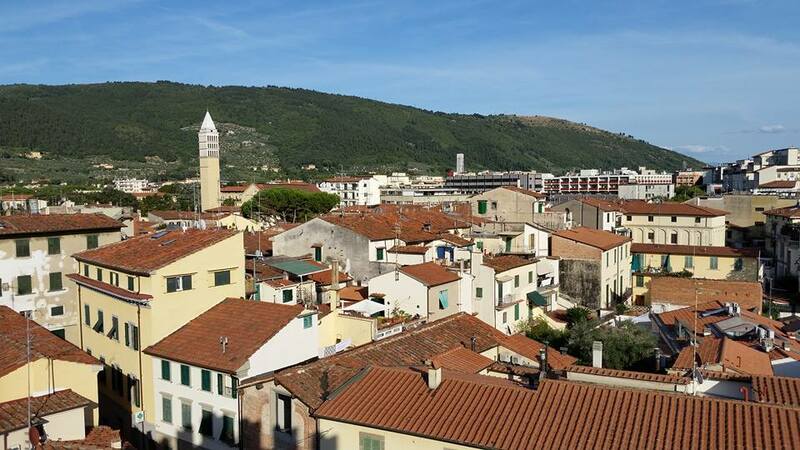 Our third city was Prato. Another walled, medieval city. 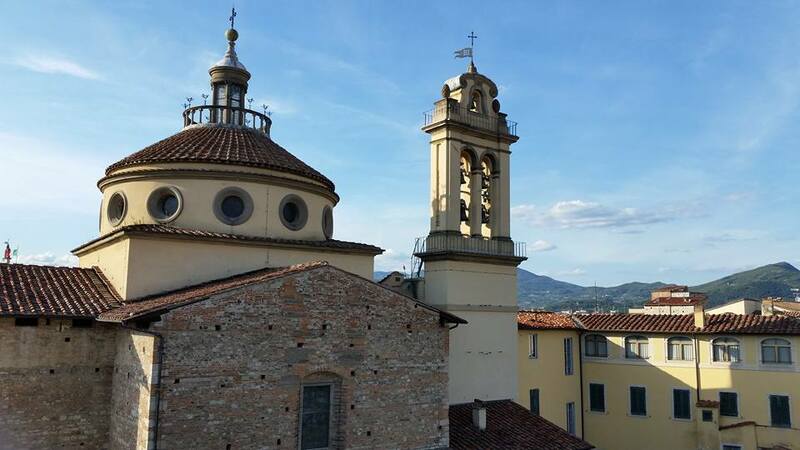 Atop the walls of Lucca. Italy. 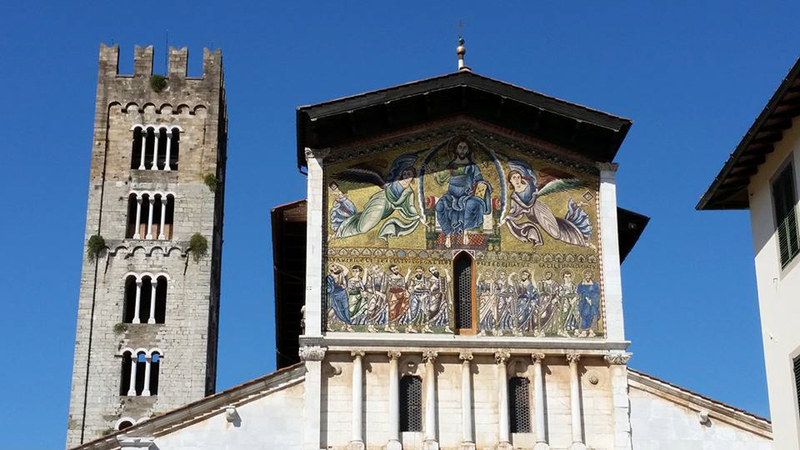 This entry was posted in Travel and tagged Italy, Lucca, Pistoia, Saint James, Saint Martin of Tours on September 10, 2015 by frjfkauffmann.